Hasbro is heading to court to go toe-to-toe with DC comics, and it’s for a very strange reason: the battle over who gets to the rights to sell toys with the name “Bumblebee” on them. With the beloved Transformer about to get his own standalone movie and a wave of merchandise to go with it, Hasbro is filing a suit seeking to block sales of DC Superhero Girls-branded Mattel dolls and Lego sets that feature the size-changing teen superhero Bumblebee. Why? Because Hasbro owns the Bumblebee name as a trademark, so they believe DC’s character could be confused with the bright yellow Autobot by the time his own line of toys starts hitting shelves. It’s a weird case, considering that Bumblebee herself is actually about a decade older than Hasbro’s transforming robot—she was DC Comics’ first female African American superhero, making her debut in December 1976's Teen Titans #45 before taking on the Bumblebee mantle three issues later. Bumblebee the trusty Autobot, meanwhile, wouldn’t appear until the Transformers franchise made its debut in 1984. 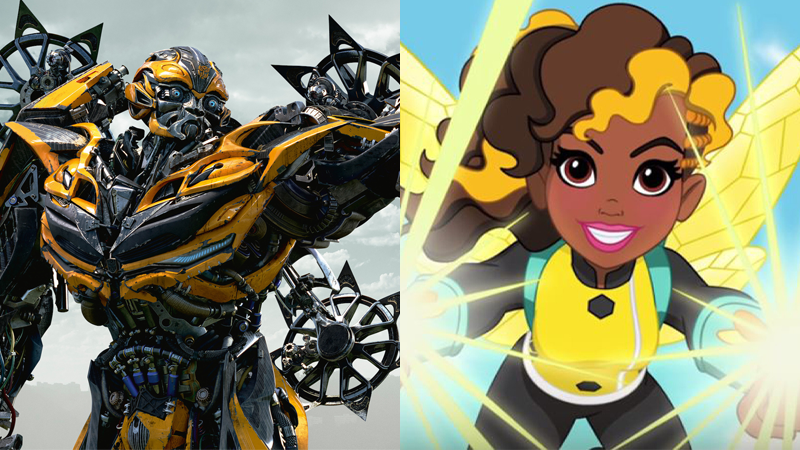 But where waters are muddied is the fact that Hasbro successfully trademarked the name Bumblebee in December 2015—several months after DC announced Superhero Girls, a new female-focused cross-media initiative that reimagined several female DC characters, including Bumblebee, as teenagers attending a superhero high school together. An animated series launched in October 2015, and since then has spun off into lines of action figures, comics, direct-to-video movies, dolls, and Lego. Hasbro is banking on its Bumblebee being more popular than the DC character, and is apparently even resorting to IGN listicles to prove it in court, according to Variety. Whichever way the case goes, it’s going to be a peculiar one.